I take this opportunity to thank all of you who came to the 150th Anniversary Gala dinner last Saturday night. It was an amazing evening filled with joy and fellowship. I met former parishioners of Our Lady of Victory who recalled stories of their time in the parish. I met new parishioners who just recently moved to the neighborhood and wanted to celebrate with us. I met alumni of Our Lady of Victory school who reminisced about their time with the nuns who ran the school. Over 250 people came to support the parish and to celebrate this milestone! I want to thank the anniversary committee who worked tirelessly to make last week’s dinner successful and memorable. Both Father Kingsley and I are blessed to be shepherds to a wonderful flock here at St. Martin dePorres. Our next fundraiser for the 150th Anniversary of Our Lady of Victory Church will be a musical concert entitled, Shades of Color: Celebrating our Diversity Through Music. This concert will show case the incredible diversity of our parish along with our strong network of performers and creatives. It will take place on Sunday, May 6 at Our Lady of Victory Church beginning at 4:00PM. Tickets available for purchased after Mass or at the parish office. The St. Peter Claver League of the Sacred Heart will hold their annual tea party today, Sunday April 29 at St. Peter Claver Church. It will take place after the 11:30AM Mass in the lower hall. Father Patrick West will be the keynote speaker. Tickets are $30 for adults and $15 for children. 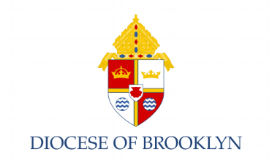 It is that time for this year’s Diocese of Brooklyn Annual Catholic Appeal. As you all know, the Annual Catholic Appeal helps to support the many ministries throughout the Diocese. This year’s theme is Answer the Call. As members of the mystical body of Christ, each of us are called to preach the Good News of Jesus Christ by the example of our lives. The Annual Catholic Appeal also supports the initiatives of the 197 parishes that make up this incredible Diocese. Our parish goal for this year’s ACA is $59,519. This goal is very much attainable if each of us answers the call to participate in any way that we possibly can. We average about 800 people for Mass each weekend between our three churches. If each of us can participate in this year’s appeal not only can we make our goal, but we can go over it. Anything over the goal comes directly back to the parish. When I say “we” that includes myself. This year, as I do each year, I personally will contribute $1,000 to the 2018 ACA. Why do I say that? It’s important that you know that I would never ask you to do something that I myself would not do! This weekend we will see the ACA video and conduct the in-pew for those who have not already contributed. Thank you for your generosity. Today is the 4th Sunday of Easter, traditionally known as Good Shepherd Sunday. Our gospel passage today speaks of Jesus as the Good Shepherd. Our Lord tells us that a shepherd lays down his life for the sheep. Jesus is truly the Good Shepherd who nourishes, sustains and protects us. We are the flock that Jesus the shepherd laid his life on the cross for! On this Good Shepherd Sunday, let us continue to pray for our shepherds on earth today, that is our Holy Father, our bishops and priests. Today in Rome, Pope Francis will ordain men to the priesthood for the Diocese of Rome. Today I reflect on my own priesthood, thanking God for calling me to serve the church as a shepherd. In his very first priesthood ordination as Pope, Francis spoke of the joys of priesthood. When speaking to the men he was about to ordain to the priesthood, he said, “You will gather others into the people of God through Baptism, and you will forgive sins in the name of Christ and the Church in the sacrament of Penance. Today I ask you in the name of Christ and the Church, never tire of being merciful. You will comfort the sick and the elderly with holy oil: do not hesitate to show tenderness towards the elderly. Therefore, carry out the ministry of Christ the Priest with constant joy and genuine love, attending not to your own concerns but to those of Jesus Christ. You are pastors, not functionaries. Be mediators, not intermediaries. Finally, dear sons, exercising for your part the office of Christ, Head and Shepherd, while united with the Bishop and subject to him, strive to bring the faithful together into one family, so that you may lead them to God the Father through Christ in the Holy Spirit. Keep always before your eyes the example of the Good Shepherd who came not to be served but to serve, and who came to seek out and save what was lost”. In your kindness, I ask all of you to pray for your two shepherds here at St. Martin dePorres, Father Kingsley and myself. Our next fundraiser for the 150th Anniversary of Our Lady of Victory Church will be a musical concert entitled, Shades of Color: Celebrating our Diversity Through Music. This concert will show case the incredible diversity of our parish along with our strong network of performers and creatives. It will take place on Sunday, May 6 at Our Lady of Victory Church beginning at 4:00PM. Tickets are $40 and can be purchased after Mass or at the parish office. The St. Peter Claver League of the Sacred Heart will hold their annual tea party next Sunday April 28 at St. Peter Claver Church. It will take place after the 11:30AM Mass in the lower hall. Father Patrick West will be the keynote speaker. Tickets are $30 for adults and $15 for children. We have begun our 2018 Annual Catholic Appeal. As you know, the ACA helps to support the various ministries of the Diocese and within the parish. Next week we will view the video and have an opportunity to take the in pew pledge for those who have not yet contributed. Thank you for your generosity.